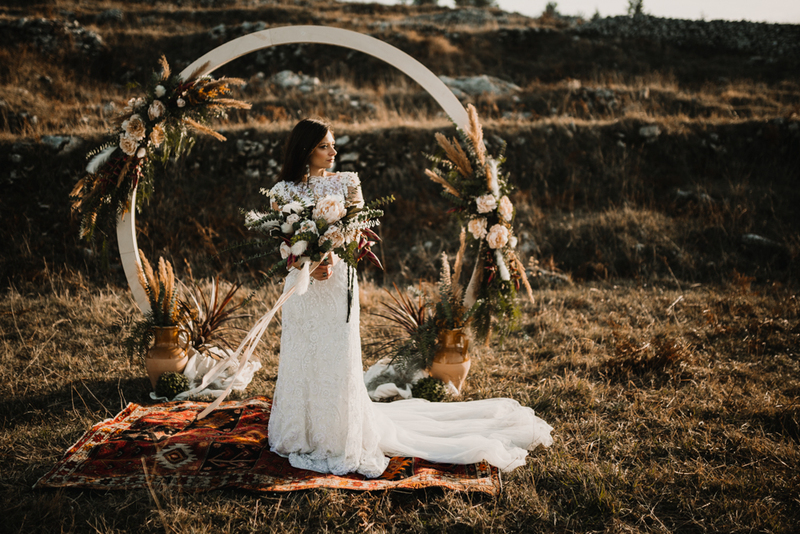 Calling all free spirited boho brides, this gorgeous inspiration planned and styled by Antonia Luzi at The Majella National Park (Abruzzo, Italy) is for you. We’ve fallen head over heals for the immense moon gate and Persian rug focal point. Adorned with the most beautiful peach flowers, dried grasses and foliage, and sitting very pretty amongst the natural location. Plus the brides dirty boots and messy hair wild look, really encompasses what being free is all about. 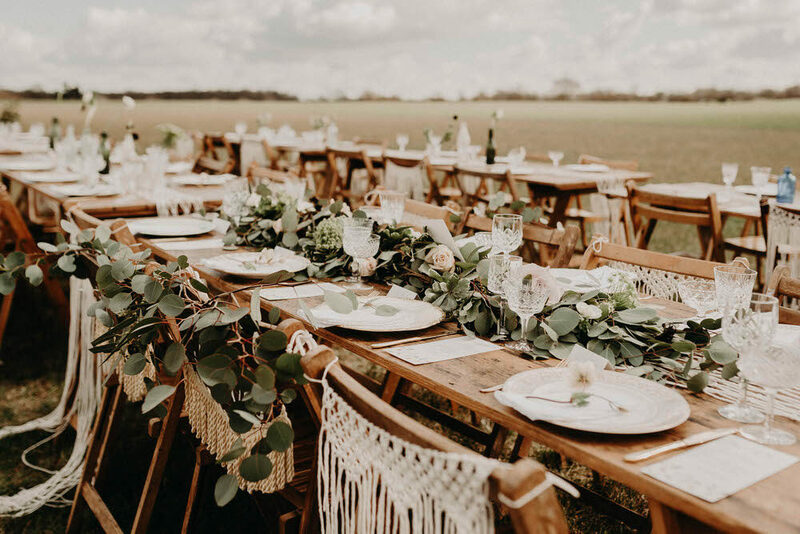 There’s plenty more to swoon over and pin too, thanks to the gorgeous captures by Federico Lanuto Photography, including an intimate tablescape and simple, but decadent single tier wedding cakes. 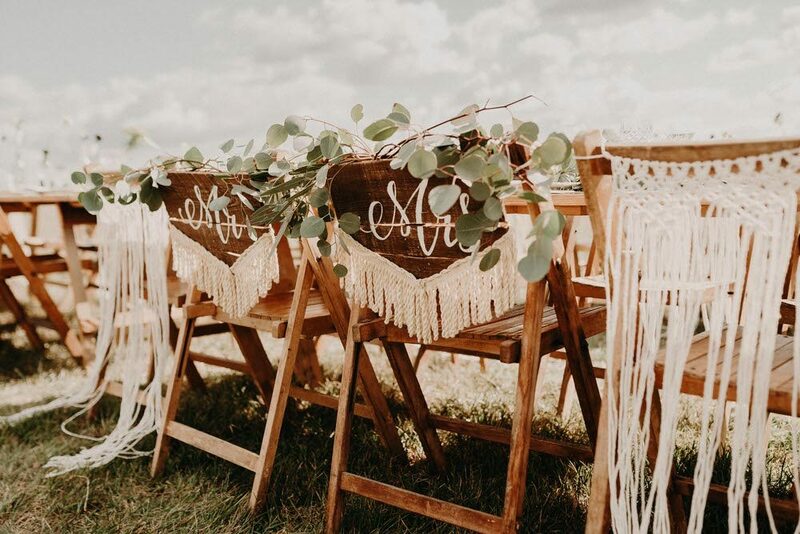 Not to mention some gorgeous uses of hoops as menus, table plans and dream catchers. All the heart eyes. 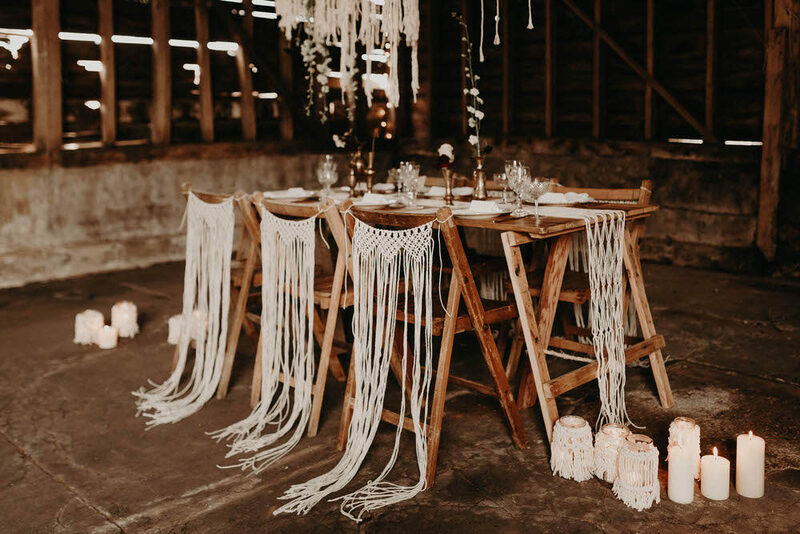 Not only have Fringe and Fray got an awesome name for their Macramé business, but they’ve also got an incredible talent for styling too. 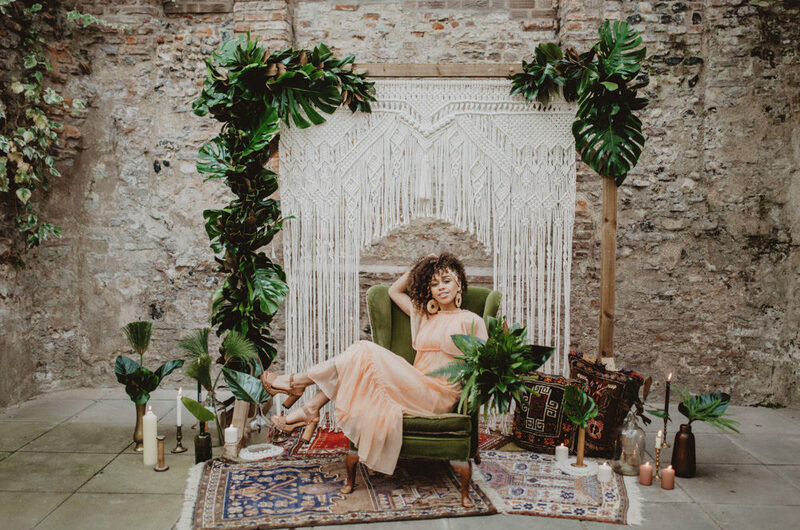 This wonderful bohemian inspiration mixes the free spirit of the seventies with tropical leaves and vintage bridal wear all in a rustic setting. Proving you truly can have a day your way. 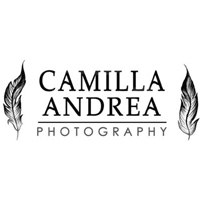 Camilla Andrea Photography has really brought the concept to life with her captures and I’m sure you’ll be pinning before you know what’s hit you. The skies are grey and the temperatures are set to plummet, there’s even talk of more snow! 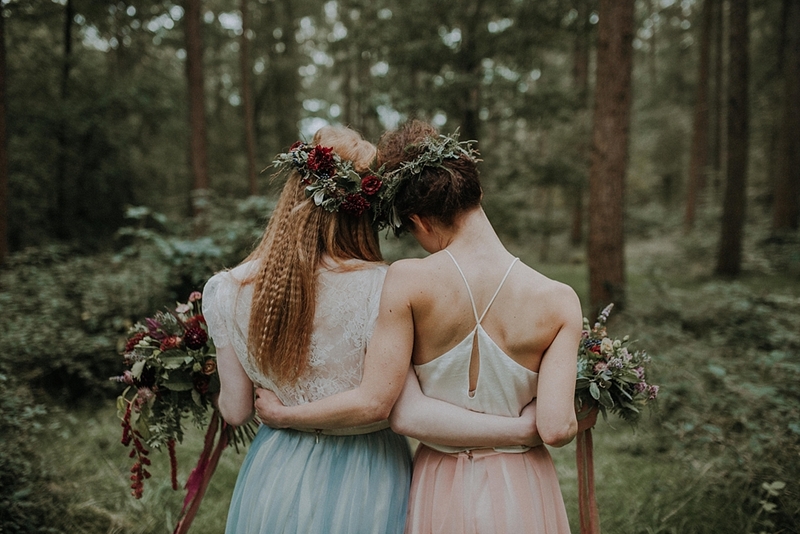 But this Bohemian Winter inspiration shoot by Pretty Creative and Amy Faith Photography is certainly making up for the lack of sun during this Easter Spring Bank Holiday. It’s cosy, it’s beautifully styled with Nordic influences, and proves even the moodiest of days can be the best of days. The Lakeside views full of tipi’s is utterly divine and a reminder marquees are not just for Summer. 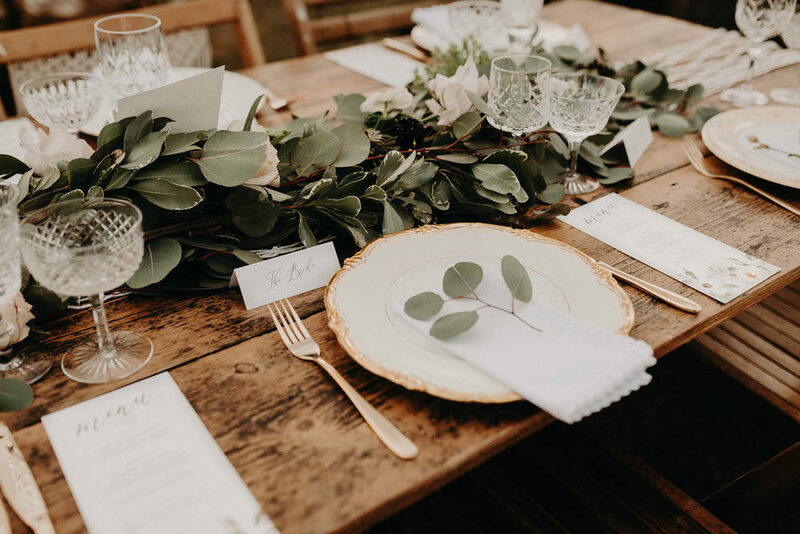 The greenery decor perfectly compliments the surroundings and I love all the geodes, feathers and cotton bud twigs added for texture and luxe against all the natural beauty. Now if you’re trying to avoid the chocolate this is the perfect way to curb your craving but fill the void. Utterly delicious from start to finish. Enjoy. Don’t get me wrong I love the snow, but after a few days I’m over it and am thoroughly looking forward to the big melt and all the lush greenery reappearing. That’s why this luxe woodland inspiration is getting my pulse racing. 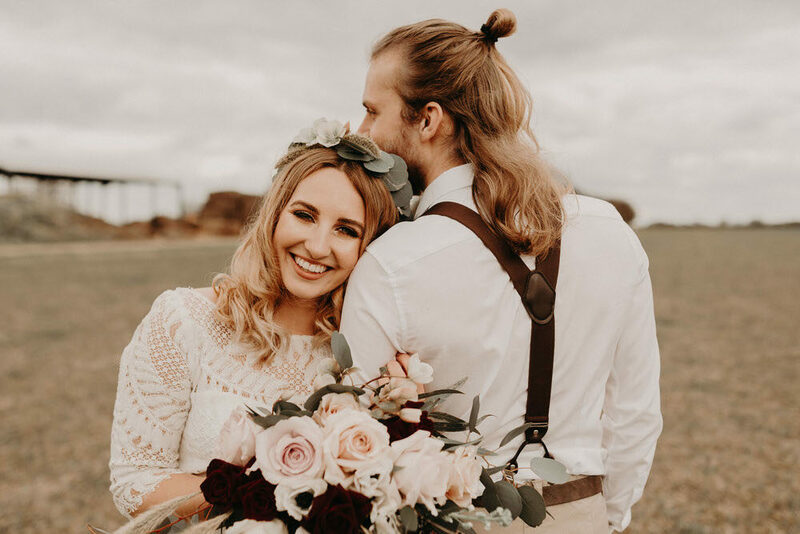 The colours and textures are truly exquisite and the beautiful boho concept has been captured, planned and styled to perfection by members of our very own hand picked wedding supplier directory The List. 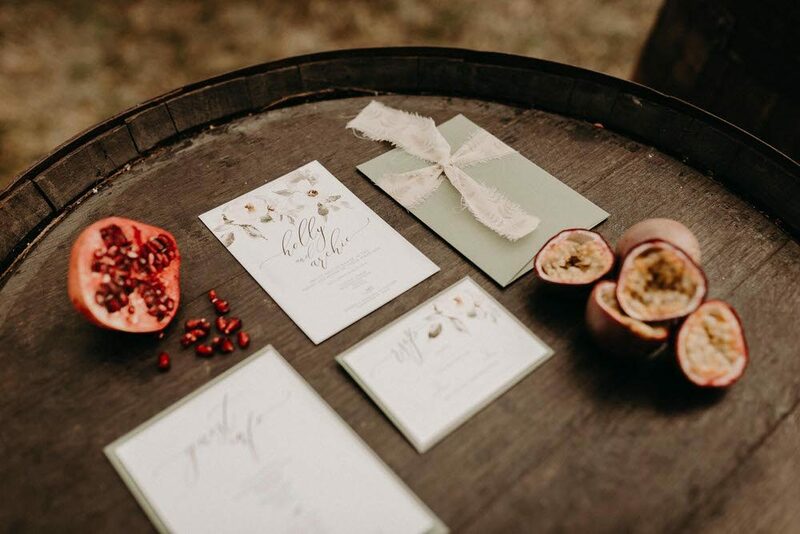 From the delicious stationery designs by White Olive Designs to the moody captures by Lola Rose Photography you’ll be hard pressed not to feel inspired by every. Last. Detail. Pinning fingers at the ready! One of my enduring memories from when I was a wee one was catching one of the most beautiful bouquets I had EVER seen from the hands of a stunning bride who I believed was a princess. Granted I was stood about 3 feet away from her and she more or less handed it to me rather than tossing it over her shoulder. I should mention here that there was also an absence of overexcited females jostling for prime catching position in case you’re picturing me as a miniature Vinnie Jones having elbowed my way to the front. Nonetheless for the rest of that day I felt special, like I’d been given access to an exclusive club because I’d caught the bouquet. Not even going home in my M&S vest and pants, having been divested of my bridesmaid dress because it was rented could tarnish my little glow of glory. That was the best day. I’ve always believed that my triumphant catch was the catalyst for my life-long obsession with beautiful blooms and especially with wedding day bouquets. So allow me to indulge this weakness of mine and let me show you lovelies some of the best arrangements out there in wedding land (in my humble opinion). I want to hear about which ones are your favourites. Which style pulls at your heartstrings? What colour scheme have you selected for your big W-Day? There’s something beautifully exquisite about white blooms. Elegant in their simplicity, they possess a sophistication that is hard to surpass. Milky-white flowers are usually heavily fragranced too providing you with a double whammy sensory experience. 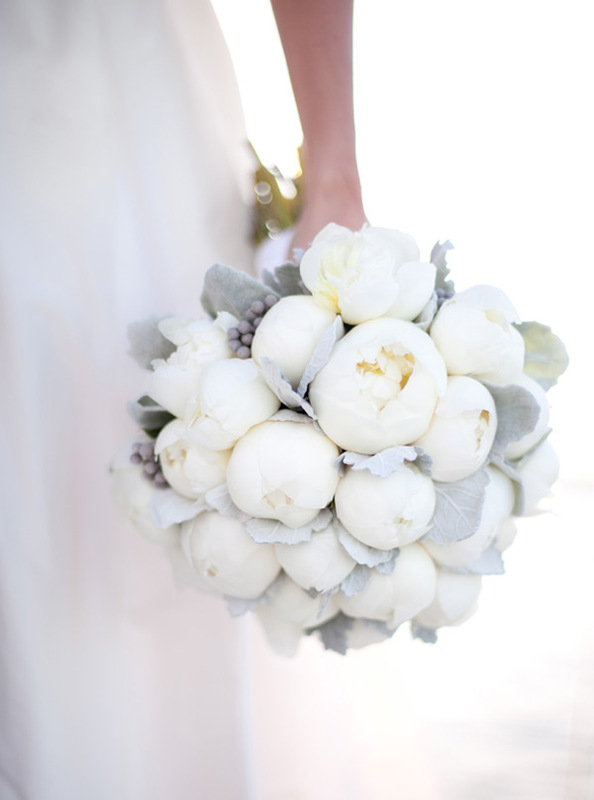 White bouquets are wonderfully versatile in several ways. 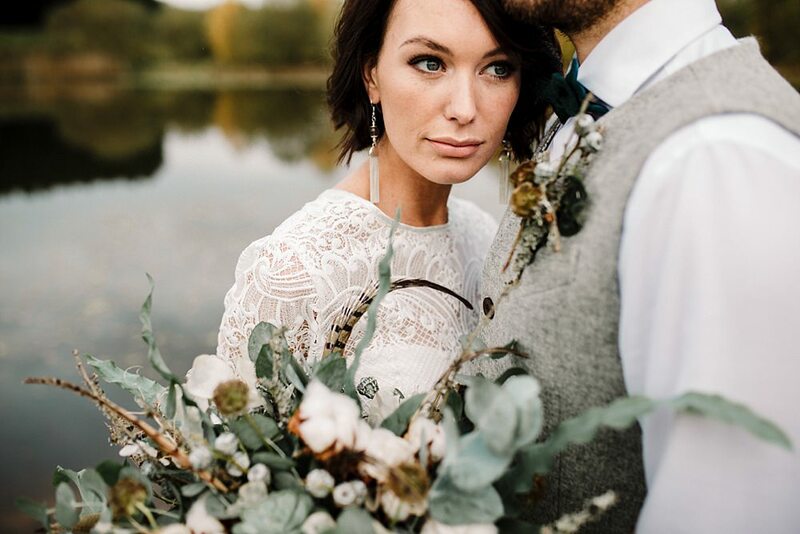 Not only can you guarantee that they will perfectly complement your gorgeous gown – chalky-white flowers are also more or less available any time of the year which means that you should nearly always be able to find a blossom to suit your purposes. Top Row Left: Photography by Elizabeth Messina. Top Row Right: Image via Love Wed Bliss. Second Row: Florals by Modern Bouquet. Third Row Left: Image via Yellow Door. Third Row Right: Image via Green Wedding Shoes. Fourth Row: Florals by Fairynuff Flowers, Photography by Marianne Taylor. Fifth Row Left: Image via Harmonies Du Soir. Fifth Row Right: Image via Style Me Pretty. 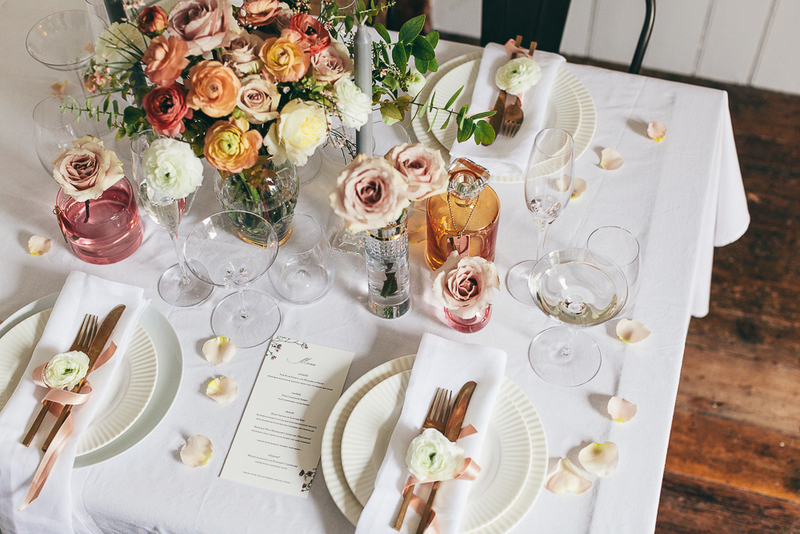 Bottom Row Left: Image via Martha Stewart Weddings. Bottom Row Right: Florals and Image by Birksen. Choosing alabaster-toned garlands also gives you the freedom to play with texture and composition safe in the knowledge that no two flowers will clash nor will it appear like you’ve gone overboard in the floral department. If you do want to inject a bit of colour into your neutral palette, green is perfect accent tone because it allows the blooms to shine without overpowering them. That Mother Nature… she knows a thing or two. Berry Fest is a contemporary interpretation of the more classic Rose bouquet. 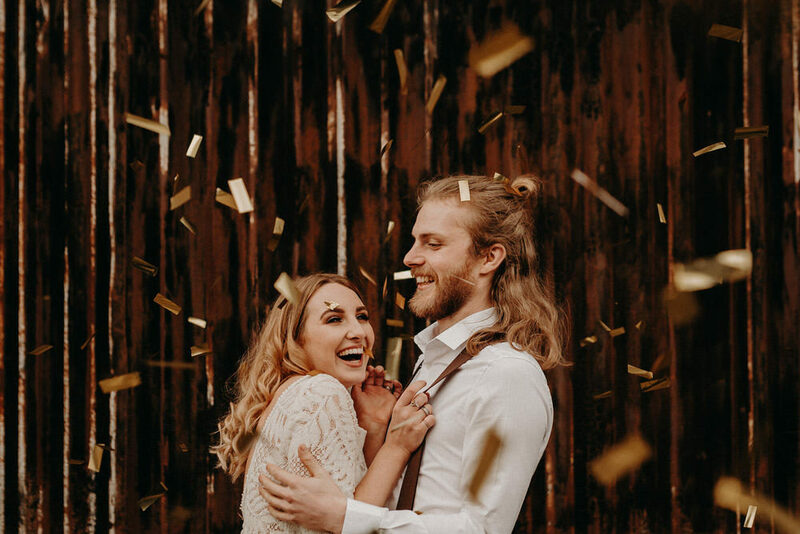 It is utterly romantic without being saccharine sweet therefore perfect for those brides who want something edgier without losing sight of more traditional wedding themes and flavours. This type of bouquet is perfect for weddings between June to September because of the availability of local materials. Queen Anne’s Lace, Dahlias, Clematis, Black Basil, Stocks, Snapdragons, Amaranth, Peonies and Delphiniums are fantastically versatile blooms and can be paired together in all number of combinations. Top Row: Image via Green Wedding Shoes. Second Row Left: Image via I Heart Flowers. Second Row Right: Image via My Wedding Concierge. Third Row: Image and Florals via The Byrd Collective. Fourth Row Left: Image via Flaming Petal. Fourth Row Right: Image via Green Wedding Shoes. Fifth Row: Florals by Amy Merrick. Bottom Row Left: Florals and Image via Saipua. Bottom Row Right: Image via Ruffled. There’s nothing quite as sublime as an Autumn berry rich bouquet bespeckled with seedheads and the last hurrrah of summer. If you’re going for this type of feel with your own posies then I’d recommend pairing lighter shades with darker ones as the contrast makes each colour pop. Lastly try echoing the trailing tendrils of the bouquet with some velvet ribbon around the stems in a similar colour scheme for extra drama. 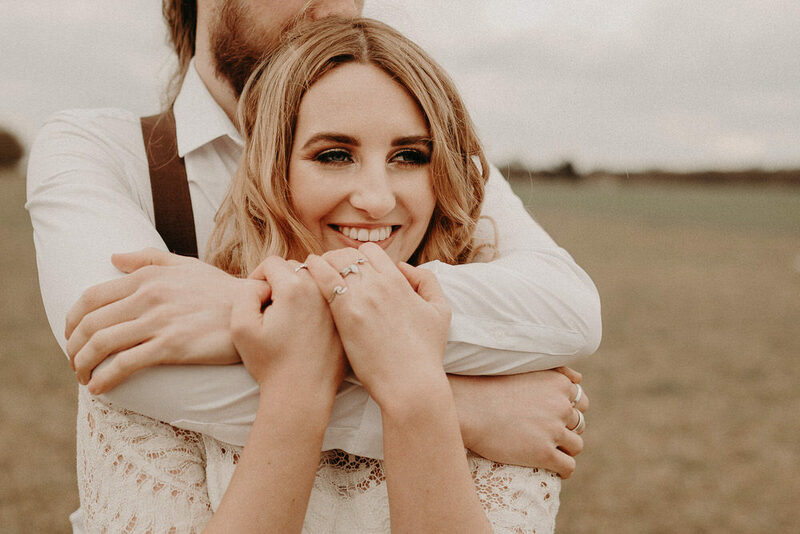 I ADORE this trend with a great big dollop of LOVE on top because it’s just one of the many signs of how modern brides are becoming more and more creative with their big day. 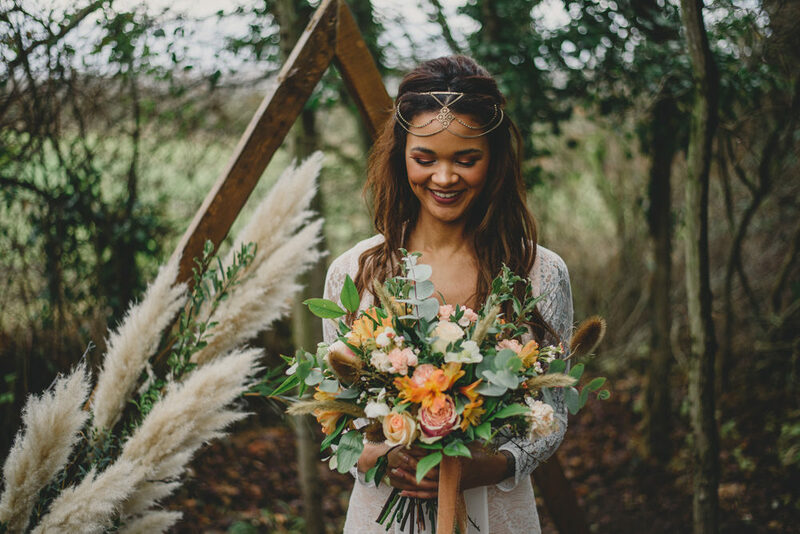 ‘Handpicked’ bouquets have an ethereal, just picked from the hedgerows quality about them. Wild and overgrown, these posies feel wholesome and organic and are especially beautiful when paired with a soft simple gown and bare feet. Not that I’m saying you should all go barefoot or anything. Top Row Left: Image via Style Me Pretty. Top Row Right: Image via Bows and Arrows. Second Row: Image and Florals via Saipua. Third Row Left: Image via Once Wed. Third Row Right: Photography by Simply Bloom. Fourth Row Left: Image via Flaming Petal. Fourth Row Right: Image via Plum Tree Weddings. Fifth Row: Image via PassionFlower Events. 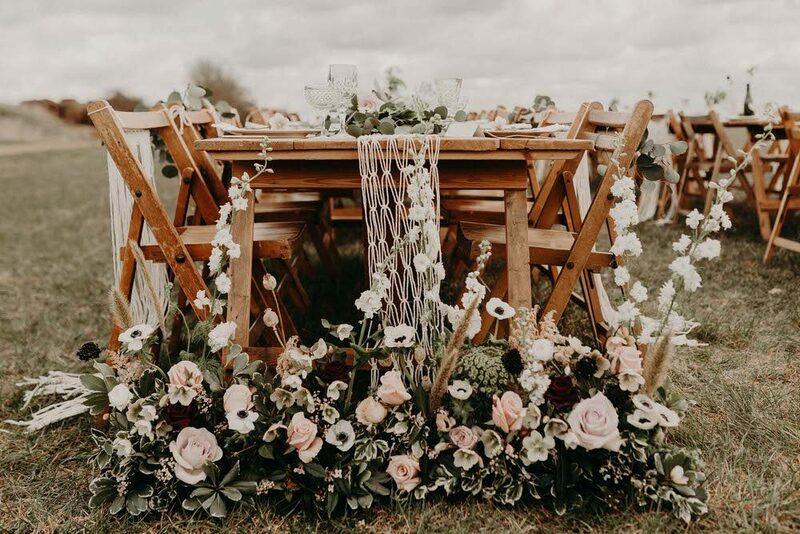 Any decent florist can recreate this concept easily for you; equally choosing this more relaxed style is perfect for the artistic bride as well as for those on a budget who want to take up those horticultural reins and produce their own floral arrangements. My personal preference is to keep the hues in an handpicked bouquet within the same colour spectrum but using as many as six or seven different colours is just as effective. Secondly remember to include a little bit of everything so that you capture that unruly essence and prevent your posy from appearing too ‘done’. 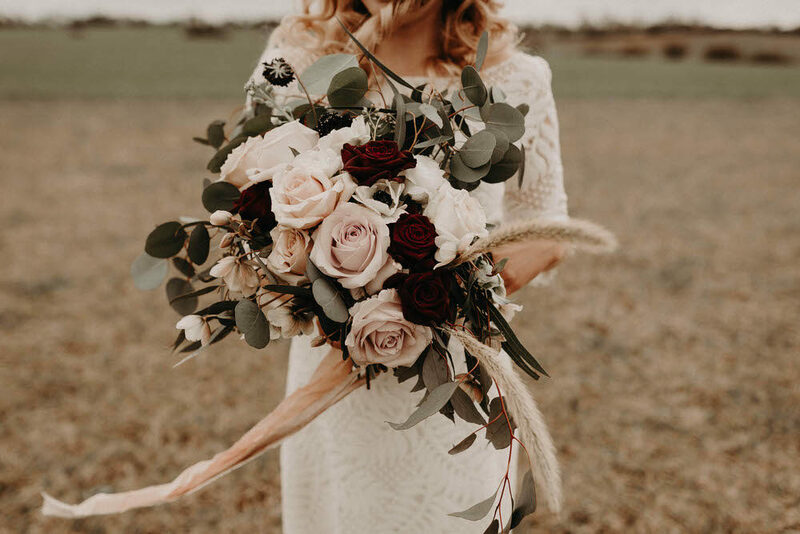 When we think about bouquets, we tend to think about the profusion of blooms and the colours of the delicate tendrils rather than the twiggy base. But, whilst I was writing this post, I found it hard to pass up the opportunity to show you lovelies how beautifully your floral accessory can be finished. Top Row Left: Image via Elizabeth Anne Designs. Top Row Right: Image via JL Designs. Second Row Left: Image via Lovely Bride. Second Row Right: Florals by Matthew Robbins Design. Third Row: Photography by Mike and Shari via Rock My Wedding. Fourth Row Left: Image via A Crimson Kiss. Fourth Row Right: Photography by Jose Villa. Fifth Row Left: Image via I Heart Flowers. Fifth Row Right: Photography by Elizabeth Messina. Hessian, lace, wool, twine and even brown paper and string can be artfully wrapped around your bouquets for the pièce de résistance. I especially love the idea of a bride wrapping a piece of material that her gown is made from around her posy. Talk about matching your outfit to your accessories! But ribbons are my vice – yes girls I actually have a ribbon box and have also been known to filch ribbons from other people’s presents (once opened of course!) to keep it fully stocked up. So for me a beribboned garland steals the day and frankly the more the better. Why have one glitzy strand when you can look like a haberdashery shop and have three or even five. If these blooms were a woman, they’d be a medieval buxom wench winking saucily at any hot-blooded male from the other side of the bar. These sultry beauties vie for your attention flaunting their silky soft petals and their heavy aroma unrelentingly at you. I just want to bury my head into them. Top Row Left: Image via Elizabeth Anne Designs. Second Row Left: Florals by PassionFlower Events. Second Row Right: Image via Bridal Musings. Third Row: Image via Hello Love. Fourth Row Left: Image via Flaming Petal. Fourth Row Right: Image via 100 Layer Cake. Fifth Row Left: Image via Dust Jacket Attic. Fifth Row Right: Image via Holly Flora. Peonies and large garden roses are most commonly used in these types of bouquets and are frequently supplemented by soft green foliage and succulents of late. Because of the sheer size of the flowers there really is no need for anything extra. Trust me, adding too much to a ‘big and blowsy’ bouquet would result in a serious case of ‘over-egging the pudding’ and ladies I say that as a self-confessed flower addict. 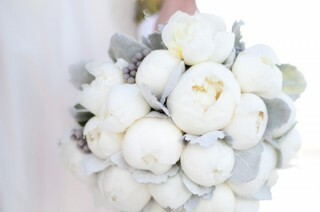 For the modern bride, who wants both drama and simplicity, a single huge bloom is your answer; it is unbeatably chic. And that bloom that the bride and groom are hiding behind is made of…wait for it…paper. One last thing worth mentioning is that these types of arrangements are often really heavy – it’s just something to be conscious of when posing for your photographs in case you get arm ache (is that even a condition?). Are fresh flowers the order of the day or have you set your heart on something with a little more longevity like those bouquets made from antique brooches for example. And I NEED to hear your thoughts on tossing the bouquet. Is this a tradition that you can’t pass up or can you not bear to throw your blooms into a gaggle of hopeful ladies in case it gets damaged? More and more florists claim that they are creating additional ‘tossing’ bouquets for precisely this purpose. Is this something that interests you girls or does it defeat the whole point?